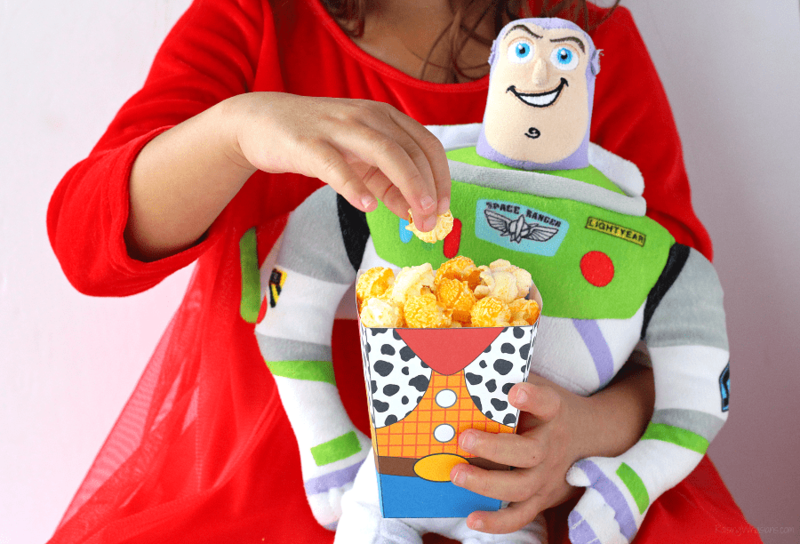 Grab your rowdy Disney bunch for these Easy Toy Story Movie Night Ideas + FREE Printable Popcorn Box for family movie night! This post is sponsored by G.H. Cretors as a Flavor Obsessed Five Ambassador. All delicious opinions are my own. Who loves family movie night? *Raises hand. 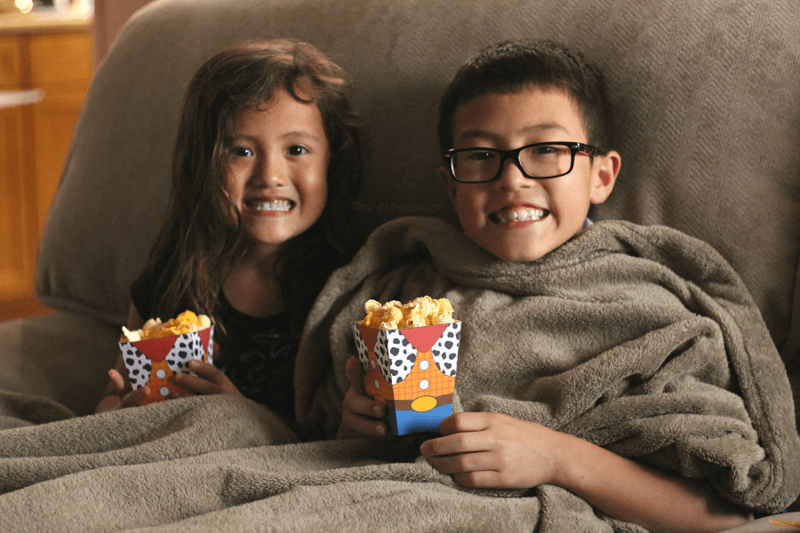 * There’s nothing that brings our family together quicker than a good movie, snugly blankets and our all-time favorite movie time snack, popcorn. 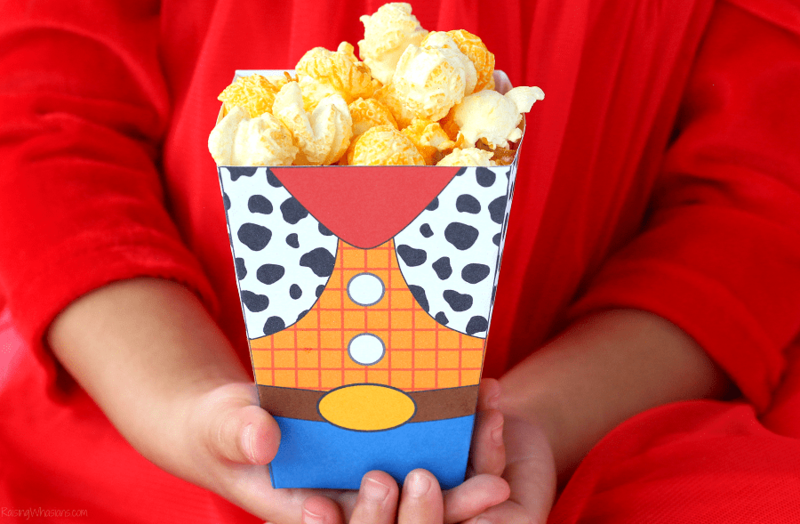 So curl up on the couch with these Easy Toy Story Movie Night Ideas, an adorable FREE Printable Popcorn Box featuring our favorite cowboy, and of course lots of delicious G.H. Cretors popcorn. It’s not family movie night without the popcorn! And not just any popcorn will do for family movie night. We need perfectly popped, deliciously flavored popcorn. Just in time for your rowdy Toy Story movie night are two new G. H. Cretors flavors that are sure to be a crunchy hit! New G.H. 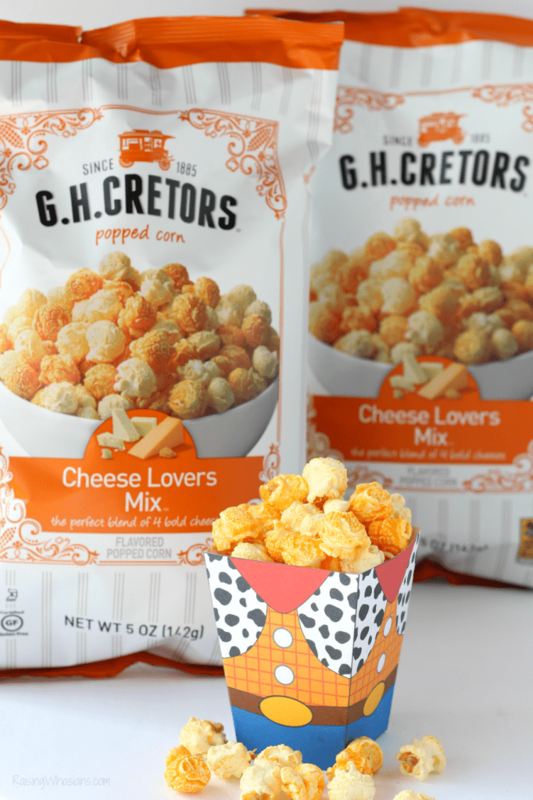 Cretors Cheese Lovers Mix popcorn combine four times the cheesy goodness flavor. White cheddar, romano and parmesan cheeses give the white-cheese popcorn a “pop” of delicious flavor. Then combine with the sharp yellow cheddar cheese and you have a mix of delicious fun! My kids LOVE this cheesy flavor – perfect for movie night munching. And let’s not forget the BOLD flavors for the adults! My husband and I devoured an entire bag of the new G.H. 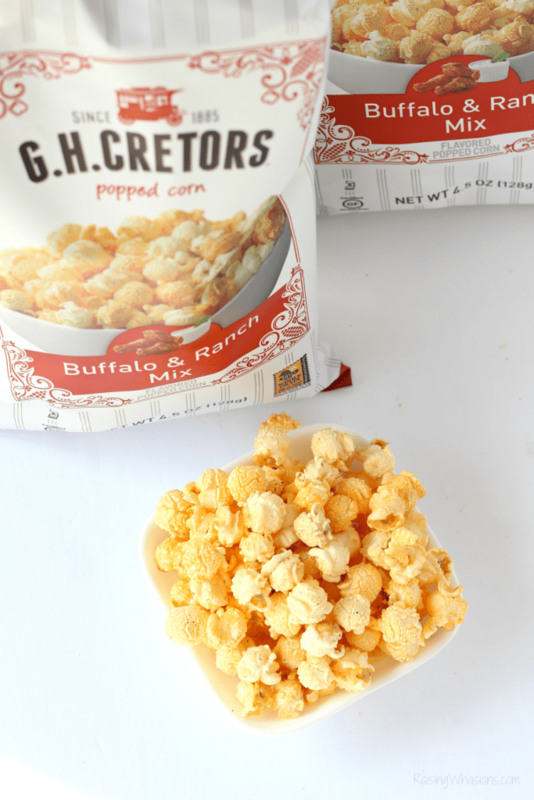 Cretors Buffalo & Ranch Mix popcorn. The heat of buffalo kernels combine perfectly with the cool ranch kernels. Heat + Cool = YUM! So how did these new G.H. Cretors popcorn flavors turn into a Toy Story movie night? The Buffalo & Ranch popcorn immediately gave this party a cowboy feel, don’t you think? 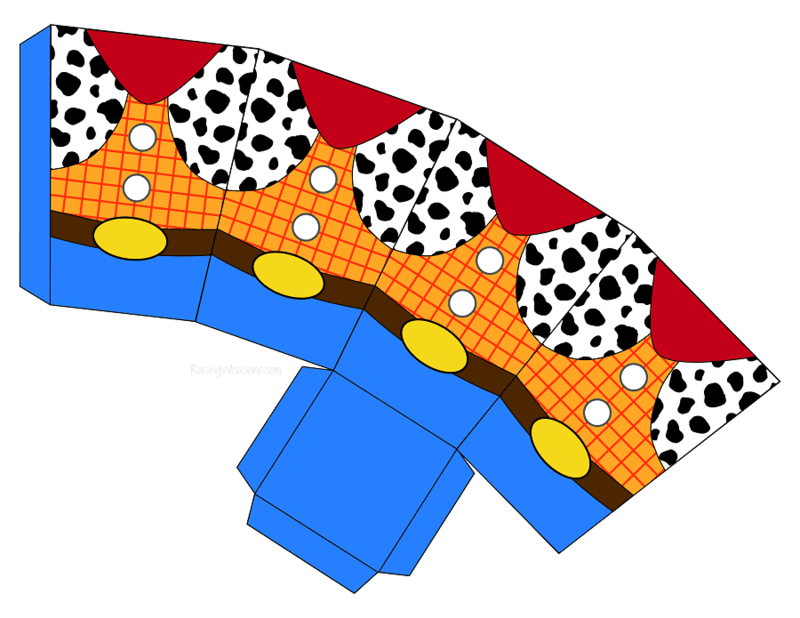 So of course, our favorite Disney cowboy came to mind – Woody! The new G.H. Cretors Cheese Lovers popcorn colors reminded me of the colors of Woody’s western shirt. Perfection! 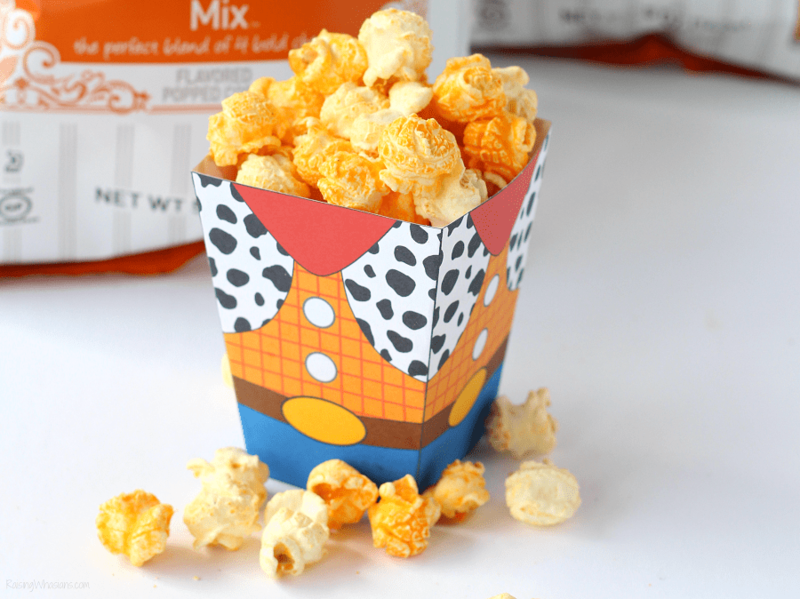 To celebrate the new popcorn flavors AND our favorite cowboy, I created this fun FREE printable Woody Popcorn Box! 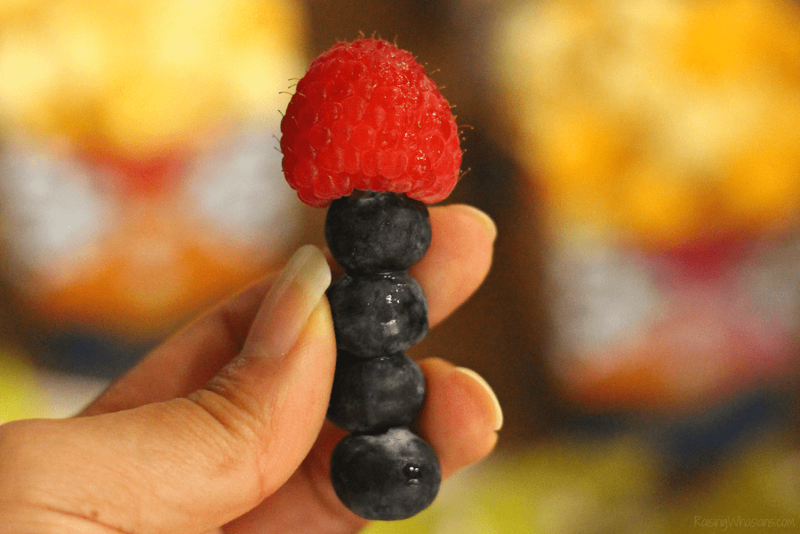 How cute would these be at your family movie night? Click the link to print (I recommend thick cardstock), cut, fold and tape/glue to create the perfect little popcorn containers. Easy! Blast off with Buzz Lightyear and these easy Rocket Fruit Skewers. Your kids will love the sweet taste of fresh raspberries and blueberries on a stick as they blast off with Woody and Buzz in the movie! Take me to your belly! I couldn’t resist a little extra sweetness to balance our savory G.H. Cretors popcorn. 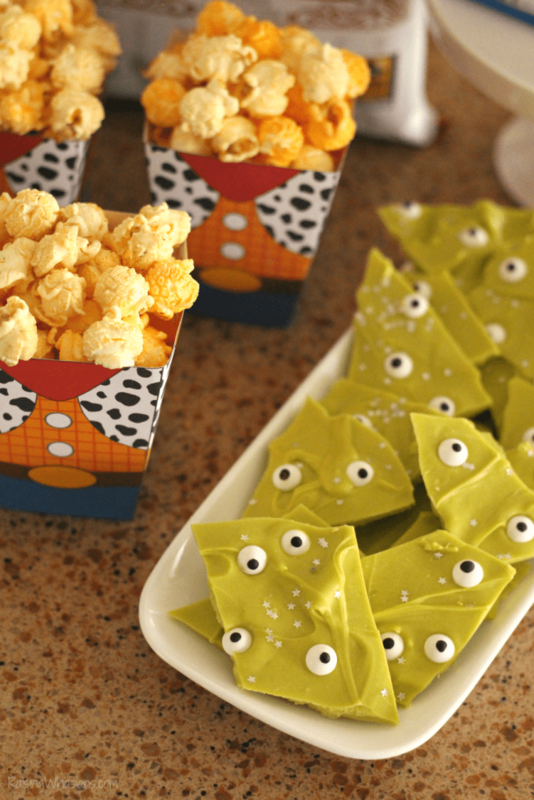 Some green candy melts, candy eyeballs and edible silver stars make the perfect easy Toy Story alien bark! Just melt the candy, add your toppings, refrigerate, and break into bite sized pieces! 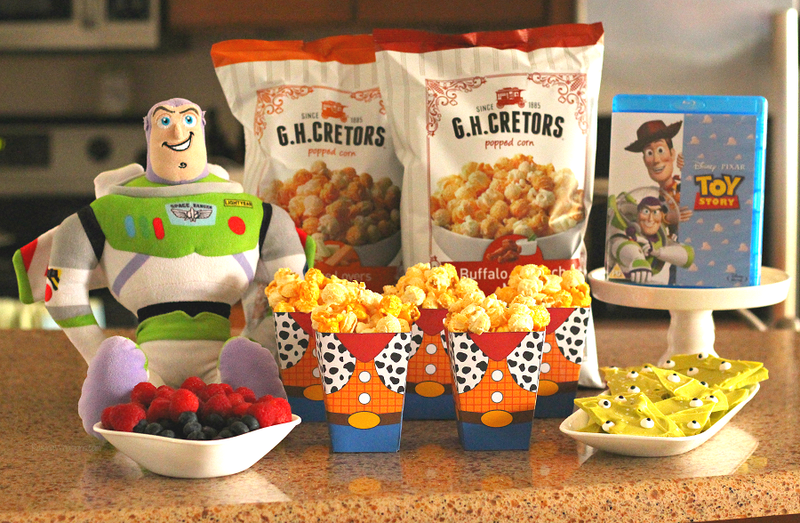 Enjoy these Easy Toy Story Movie Night Ideas + FREE Printable Woody Popcorn Box for your next Disney movie night. And don’t forget the popcorn! Look for the new Buffalo & Ranch and Cheese Lovers G.H. 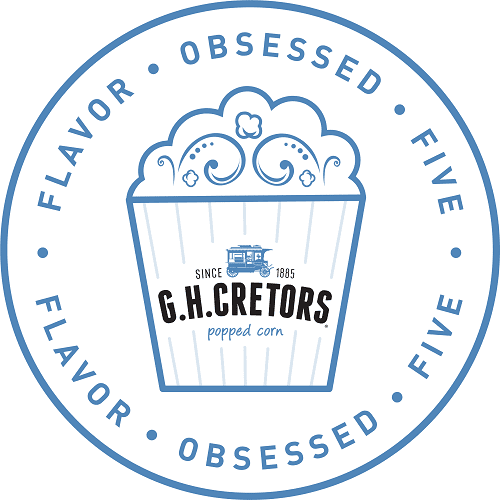 Cretors popcorn flavors at your local G.H. Cretors’ retailer. These flavor combos are sure to be a cowboy-approved delicious movie night snack! Be sure to follow G.H. Cretors via Facebook, Twitter, Instagram and Pinterest for delicious popcorn inspiration, new flavors and more. So excited to bring you these Easy Toy Story Movie Night Ideas + FREE printable as a part of the 2017-2018 G.H. Cretors Flavor Obsessed Five Ambassadorship! Be sure to follow Raising Whasians via Facebook, Twitter, Google, Instagram, Pinterest and YouTube for more easy family movie night ideas, free printables, and crafty fun! How cute is this popcorn box?? My younger nieces and nephews would love it. That is such a cute idea! I love doing things like this to help make movie night more special. I have to make these! We LOVE all the Toy Story movies. My kids love movie nights in our house and popcorn is always a must. I think you have movie night down pat with the popcorn fruit and bark how special. Oh my goodness. How adorable is this printable? So cute. I can’t wait to print it for my kiddos on movie night! What a cute printable. This would be great for movie night with my grandsons. I was going to say that looked like cheese popcorn…then I saw it was!! Yum. My favorite. How cute is this idea for a movie night! My kids would love doing this! My son loves movie nights in our house and popcorn is a favorite. I love all the treats you included in yours! Can’t wait to make some at our house! Of course you created this magical popcorn box!! You are So creative! It’s really adorable. My kids would have loved this popcorn printable when they were younger. We are huge Disney fans and Toy Story was definitely a family fave. Now those are really cool! I would love to make some of these with the kids. That is the cutest thing ever! My littles love all of the Toy Story movies, so this is going to make a beloved movie even more special. Well, my kids are all grown so we’d skip the popcorn box and probably do great with just the popcorn, fruit and alien bark. The popcorn box pirntable is really cute and I think it would be a nice little craft for my cousin to make for her young daughters. This is so cute! Such a fun idea for movie nights! Love all the details that you shared especially the popcorn box! I think it’s adorable and it’s not just for a movie night but a Toy Story theme party as well. Definitely a keeper. We love doing family movie nights, and this is such a great idea! This is the cutest popcorn box! Perfect for a Toy Story themed party! Great tips! My grandson loves Toy Story this was be a great time for us on a weekend when hes staying with me! This is so stinking cute!!! I love this perfect for a Tot Story theme party! Such a cute popcorn box!